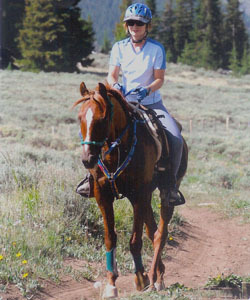 Suzanne, who has over 10,000 AERC miles began by competitive trail riding when she was 11 and then endurance as a teenager in Western Montana. Darryl mainly crews and volunteers, while also competing a few times per year. They began breeding in 1999 in an effort to raise horses that like people and more specifically to be endurance athletes with great dispositions. Why Polish? Looking back my horses have always been at least 50% polish, this was before I ever paid attention to pedigrees. I admire their correct conformation, the fact that their ancestors had to be tested on the race track prior to being sent to the breeding shed, and that immeasurable "heart" that they seem to have. Our mares are tested by accumulating 1000 AERC miles including at least one 100 mile 1 day ride. It is our belief mares are more influential than stallions in determining those traits we strive for.